I came to Bangkok during the period of the growing social conflict and political polarisation in Poland. For example, a law banning accusations of the Poles in complicity in the Holocaust was enacted by the parliament earlier this year. The law was introduced in the name of the Institute for National Remembrance, established in 1998 to investigate crimes against the Polish nation. The law limits the freedom of speech and distorts the Holocaust history and memory: in fact, Poles behaved in many different ways during the Holocaust, it also divides society into “us” and “them”. It provoked fierce discussions in Polish society, in Israel and internationally and also a wave of antisemitism and xenophobia. Although the law was partially deleted after 6 months, somewhat this example symbolises the current situation with the rise of nationalism and xenophobia including the success of nationalistic parties in Eastern Europe but also in the broader world. The refugee crisis is another example. Those who escaped from armed conflicts and repressions are not welcome in Poland and other Eastern European countries today. They are viewed as strangers and as a threat to the national identity and national security. But historically Poland (as many other Eastern European countries, including my native Moldova) had been multicultural and accepted many refugees such as Jews who escaped from the persecutions in Western Europe at the time when Poland was more tolerant and open to them. However, they were still considered as something foreign, non-Polish and their heritage was viewed as foreign too. The conflict around memory and identity has recently escalated again. Today along with Jews there are also Muslims, Ukrainians escaping from the war in the Eastern Ukraine, and other minorities who find themselves targets of hostility. I have witnessed these issues with concern as an activist of the ‘Never Again’ Association, the Helsinki Citizens Assembly and other civic groups. Being a minority member, a migrant and a human rights activist myself I found Poland these days as more closed and hostile than it used to be, when it is so easy to be transferred from the category of “us” to the category of “them”. In this context, my stay in Bangkok at such a moment became a very fruitful time for reflection, learning, sharing, establishing new contacts, finding inspiration for new initiatives and personal growth in many different ways. I appreciate both the diversity of the participants and, importantly, of the lecturers of different backgrounds, coming from different countries and representing various cultures and educational approaches, who shared with us not only their theoretical knowledge, but also their own experiences and perspectives. This makes the learning process more engaging, reflective, receptive and valuable. 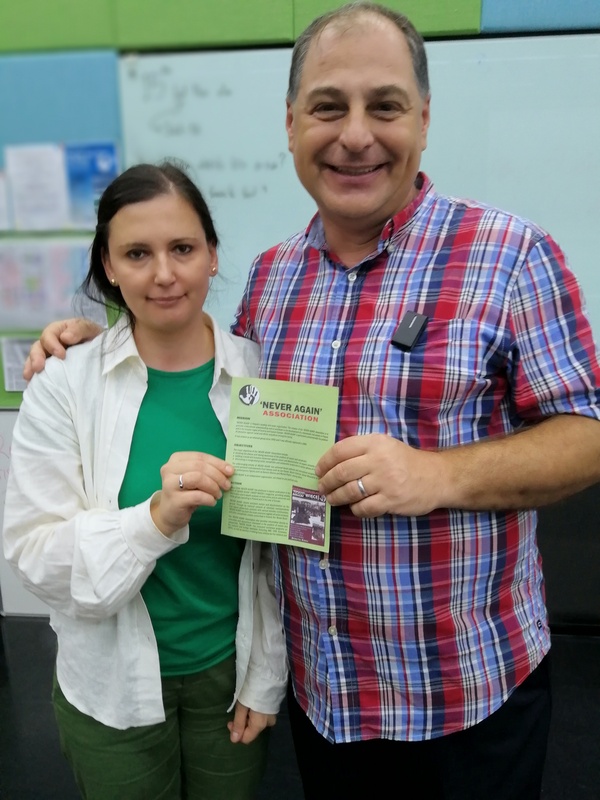 Last week I was delighted to introduce to my Peace co-fellows Professor Mirsad (Miki) Jacevic, a very experienced peacebuilding practitioner, with 25 years of work on issues of conflict prevention, conflict resolution and Transitional Justice. Originally from Sarajevo, he contributed to stopping the bloodshed and promoted post-war reconciliation in his native Bosnia and Hercegovina and has worked on Srebrenica genocide commemoration and genocide prevention. He is himself of mixed Muslim-Christian-Jewish background and has immediately established contact with each of us and empathically referred to the experience of each of us, twenty three fellows during the classes. The experiential work in groups deepened our understanding and knowledge of the capacity building and skills important for project development in the peacebuilding process. We also learnt in-depth about the Transitional Justice concept and all the related issues of dealing with the past on the global, regional, national and local levels. The process of dealing with the past in post-conflict, post-genocide societies is complex and multidimensional, which consists of two parts: legal justice in frames of the retributive justice theory, which stresses punishment and corrective actions, and the reconstruction of relationships between individuals and communities within the restorative justice theory. The former deals purely with the past, the latter considers also the element of the future. The process of dealing with the past varies from country to country with its own national specifics/adaptations to traditions and levels of sensitivity, such as the Gacaca process in Rwanda or the Truth and Reconciliation Commission in South Africa. At the same time, the discussion about the Restorative Justice and Truth Commissions made me think about our Eastern European societies again, in Poland, Moldova, and elsewhere in Eastern Europe, where we are traumatised by the negative legacies, such as Holocaust or totalitarianism, and the issue of dealing with the past is still problematic and controversial. The above-mentioned “Holocaust Law” in Poland is a characteristic example of the ongoing problems. The process of dealing with the past can be manipulated and used to divide people into ‘us’ and ‘them’ instead of uniting them. It also shows the process can be long, painful and complex. And there is still so much to be done in the field and so much depends on us, on how do we approach it in our societies and communities. I believe the museums, my professional and personal passion, are an important field for the Restorative Justice: the restoration and reconstruction of memory and identity. The museum can be a space where visitors confront the (not always convenient) difficult truths and have a possibility to reflect on it. The museum can integrate society and influence it to be more critical of its own history. Again, there is a question – why do we have so many war museums in Eastern Europe and do not have any peace museum which focuses not on making war, but on peacebuilding? This is one of the ideas and inspirations with which I leave the programme and which I hope to use, build upon and develop in the future in Poland, Moldova and elsewhere in Eastern Europe in a long-term perspective. I would like to use the opportunity to thank the brilliant staff of the Rotary Peace Center at Chulalongkorn University, my talented co-fellows, our dedicated lecturers, my Rotary hosts Mrs. Nattakan Aum Satitporn and Odd Usanachitt as well as the Rotary 2231 district governor in Poland Mr Marian Jerzy Korczynski and Dr Robert Kozielski (RC Lodz) and many others who supported me during the process of applying for the fellowship. This entry was posted on August 16, 2018 by rotarypeacechula and tagged Chulalongkorn University, Class 25, Holocaust, peace, peacebuilding, Rotary Peace Center, Transitional Justice, xenophobia.